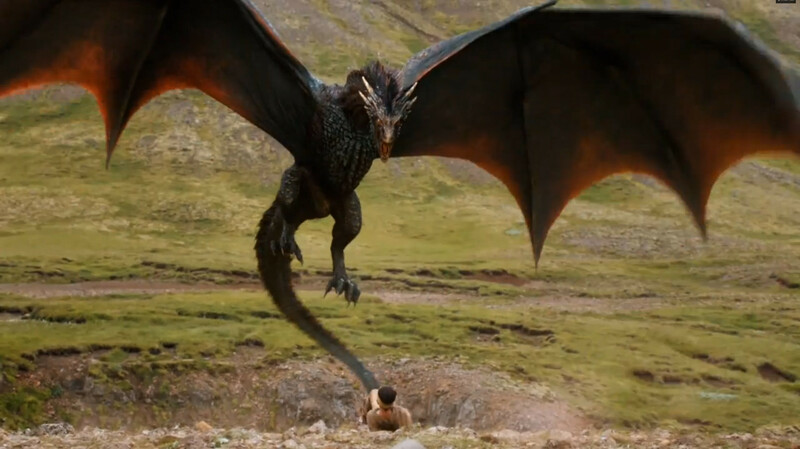 Yep, that's Tyrion Lannister getting up close and personal with one of Daenerys' dragons —Drogon, to be precise, as the picture comes from this scene of the dragon attacking goats in season 4. Note: Some spoilers from A Dance With Dragons below. So what does it mean? Well, we know that Tyrion will be finding his way to Mereen a lot more quickly on the show than he does in the Books, where he has yet to encounter Daenerys — in fact, several set pictures of filming have shown Tyrion at her side during pit fighting sequences that book readers will be familiar with, but the poster is our first official confirmation that the two characters will be meeting each other, a huge change from how the books are currently progressing (as of A Dance With Dragons, Tyrion has yet to meet up with Daenerys, and is currently just outside Mereen as a battle between between Daenerys' forces and several slaver's armies ensues). 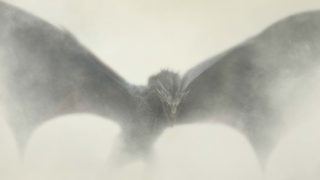 Plus, there's of course the presence of Drogon, who fled while his dragon brothers were locked away by Daenerys to ensure they don't kill anyone at the end of the last season. In the books, Drogon only returns at the climax of ADwD, seeing Daenerys flee from Mereen on the Dragon's back during a pit fighting tournament celebrating her marriage to Mereneese noble Hizdahr zo Loraq. It looks like that, at least in the show, Drogon may make some appearances sooner, especially if he encounters Tyrion on his way across the narrow sea as he does in the poster. What do you guys think? Surprised at the changes, or do you think it's just a cool poster? Either way, it's interesting times ahead for Game of Thrones, which returns on April 12th.